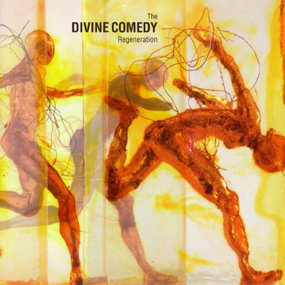 At the same time The Divine Comedy announced their signing with Nettwerk to release Regeneration on the US market on November 6th, it was also announced that on the day Regeneration would be released in Canada and Australia though EMI this time. 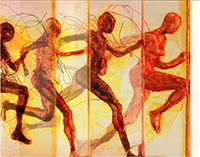 We have no information about Australian prints, and promotion. In Canada a little happened, since a specific print was issued, a promotional CD too which means a little promotion. The audience would have to wait until late 2002, early 2003 for live performances, as the band played a couple of shows in Canada as part of North-American tours. It is strange that, unlike other countries, EMI Music Canada did not get import stocks of the regular CD for distribution, and decided to reprint the album for their own domestic release. 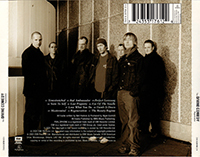 The album has exactly the same catalogue and serial numbers as the UK release, although the bar code is printed on a smaller frame on the back cover since information related to European countries are no longer required. 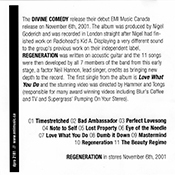 Under the tracklisting, the copyright notes details all the EMI’s labels involved in the release, and EMI Music Canada contact information are printed. On the bottom-left corner, both Parlophone and EMI Music Canada logos are printed. The promotional CD is a strange and nice item. It comes in a transparent jewel box, but features only a front insert. 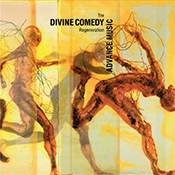 The cover has the album front cover, but in vertical the words “ADVANCE MUSIC” has been added, in a typeface that try to emulate the album title. The other side of the insert shows basic information about the album (poor Nigel Godrich is miss-spelled), tracklisting and release date.